This thing in Libya, the “humanitarian effort” — or whatever the strategic bombing of a sovereign nation embroiled in civil war is now called — is wrong. It is wrong for this country. It is wrong for this president. It is wrong for this economy. It is certainly wrong in the wake of the ongoing United States riotous 21st century foreign policy. Thus, it is wrong for these times. It does nothing but prove that no matter what manner of man occupies the position of commander-in-chief it comes complete with a fatuous level of committal to our oil masters, putting to rest any notion that what is left of this bankrupt nation’s illusionary pride is, as it has been during the whole of my lifetime, nothing but a feint echo. Turns out this fiasco was a no-go during the long weekend of March 18-20, until the Secretary of State, whose husband, as president, stood idly by when receiving reams of reports from Rwanda that there were scores of Tutsis being massacred in a systemic genocide mission, received word that the Arab League was all in favor of ousting the Libyan president but wanted the world to think it a mercy mission. This is how the West would rid the Saudis of Moammar Gadhafi and his secular abomination, sending a pack of radicals into a power vacuum. Keeps the rest of the planet from seeing the strong-arm tactics being deployed in Bahrain to prove whose boss. Libya was nothing but a sideline venture for Barack Obama until the League of Arab States put its imprimatur on things. Then it went from stoic aphorisms on the concern for world peace to guns a-blazin’; a nifty shift in foreign policy dictated once again by our masters. Why Gadhafi? Why now? This civil war, this insurrection by the latest in a long-running rabble that is “fed up” with his four decades of abject madness, is a distraction. 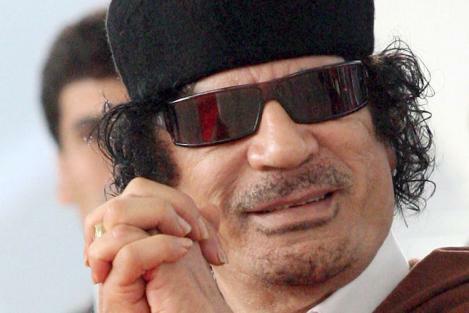 Gadhafi is useless and stupid and fearing his threats to weed out the scum in their closets and slaughter their children is equally as useless and stupid. Have we learned nothing from grandstanding millionaire oil tyrants who wave machetes for CNN? Has the State Department and the CIA finally given up, and if so, how can we sic the Republican sweep of federal budget cuts on them? No one believes Gadhafi a threat to anyone outside of his people, a people this country or the whole of Europe know less about than they knew what the Iraqis would do when we were through pillaging their country. It is the immutable right of a people to rise up against its oppressor as it is in the oppressor’s right to crush them. For instance: Let’s see how far things get around here if we run a mass assault on Pennsylvania Avenue, jack. Propping up an indistinct revolt in a tiny, insignificant stretch of arid desert in North Africa makes as much sense as the fancy euphemisms this country has offered for war tactics under every president for the past one hundred-plus years. Propping up an indistinct revolt in a tiny, insignificant stretch of arid desert in North Africa makes as much sense as the fancy euphemisms this country has offered for war tactics under every president for the past one hundred-plus years; from the annexing of Mexico and Hawaii and the Philippines and Cuba to the butting in on Korea and Viet Nam and Nicaragua and Afghanistan and Iraq. Call it a “humanitarian effort” if it pleases you, or call it a “police action”, “surge” “raid” or “project freedom”, but without the semantic gymnastics, it is an act of war. It is pushing another weak hand to the center of the table with very little in the way of chips to back it up. And what is the end game; ousting a lunatic to usher in the mob? Reports from all sides indicate that there is no central theme to the Libyan uprising, as was the sad case with the stalled Egyptian coup or Tunisia’s mutiny, where a random pack of citizenry cobble discarded WWII-era weapons and instigate land skirmishes against hired soldiers of fortune armed with Soviet-era weaponry in an all-out five-sided melee. This a revolution does not make. So, then, whom is Europe going to eventually deal with for its oil supply? And why then are we assisting this half-baked desperate attempt at securing several nations’ supplies when many of them kept their arms folded when we attempted the same thing in Iraq eight years ago to the very day? And dare we mention again that the United States military, its command and the entirety of the Pentagon, is broken and has been for decades; the gory results of its failures on display for the past ten years as third-world nations take forever to be secured and although it is gangbusters getting in, not so much getting out. And you would think that a man who stated years before he thought of running for president that using military force with no direct threat to the nation is an abuse of executive power would heed his own warnings, or the warnings of history, both recent and ancient. But here we go again; more half-truths and ambiguous mission statements, half-assed allies — including the fancy Arab League which now hedges bets and plays against rote, much like the last two decades of Pakistan’s sinkhole alliance — and a well-meaning but toothless U.N. suckering the United States into another military folly. And who is paying for this? I thought we were busted and our children doomed and our system hanging by a thread and everyone must tighten belts and sacrifice, sacrifice, sacrifice. Is this the military industrial complex making waves to remain relevant, keep the TEA Party marauders from lumping them in with Public Broadcasting and the Department of Education? Hell, a lot of entities benefit from this turn of events, but the least them is the American people, who once again bankroll a president caught in the crosshairs of international intrigue with his red, white & blue hanging out. But know this, if anyone thinks Gadhafi will get the message and back down or come to his senses or some other dime-store postulating from the same snake-oil peddlers who brought us “the Iraqis will greet us as liberators”, then prepare to be duped. It may not be a disaster, it could even end is some sort of international public relations coup, but it is wrong. And I’m fairly sure we’ve had enough of wrong around here.